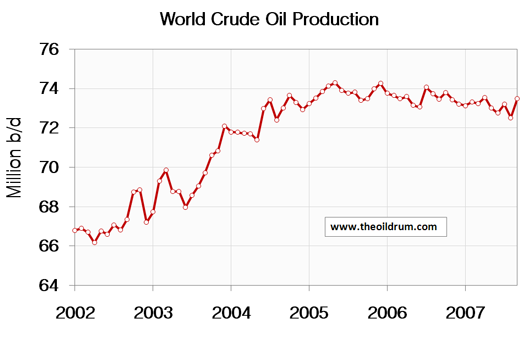 The recent surge in oil and liquids production should be news in the peak oil world, but it's not. As a piece of optimistic information, it's a sore spot, and is being carefully avoided at doomer feedlots like TOD and peakoil.com. Nevertheless, Rembrandt has the new graphs up in the January Oilwatch Monthly, so lets break through the wall of denial. The latest liquids number from the IEA (Dec. 2007) is 87mbd, a new all-time high. -- T. Boone Pickens, 9th August 2004. On the Kudlow and Cramer Show, CNBC. “Global oil [production] is 84 million barrels [per day]. I don't believe you can get it any more than 84 million barrels." -- T. Boone Pickens, addressing the 11th National Clean Cities conference in May 2005. "I don't believe that you can increase the supply beyond 84 or 85 million barrel as day." -- T. Boone Pickens, on "CNN In the Money", June 25, 2005. "Supply is—you‘ve just about had it on supply; 85 million barrels a day world supply is about it. " 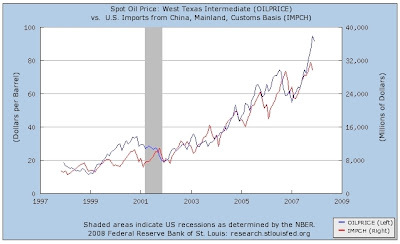 A common view in the peak oil community is that high oil prices will dampen international trade, halt globalization, and cause production of goods to be done "closer to home". The case of transportation is straightforward. Increased transportation costs act very much like tariffs, reducing international trade by raising the delivered prices of imports. Thus increases in fuel costs will likely lead to a decline in the international movement of goods, particularly for those goods shipped by air or truck, where fuel costs are most significant, and for lower- value bulk goods where transportation is a more important element in final price. In North America, for instance, food items travel an average of 1,500 miles from the growing-processing region to store shelves. Isn't that amazing? Oil hit a low of about $10 in 1998, and rose by 900% over 10 years to $100. Meanwhile, US imports from China ballooned from about $5 billion/month to $32 billion/month. Clearly, the peak oiler theory that "the end of cheap oil will be the end of globalization" has some serious problems. As you can see, the peak oiler theory that "the end of cheap oil will be the end of globalization" blows another tire. The theory blows yet another tire. Wasn't air travel supposed to be the canary in the mine shaft of peak oil? For all practical purposes, we are almost 3 years past peak oil. The allegedly toxic "gas" started leaking into the mine back in May 2005. And yet the canary is still singing strong. 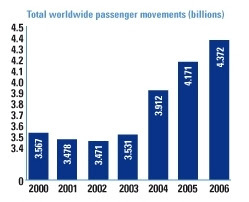 ACI also reports that, worldwide, air cargo traffic in 2006 increased by 3.6% over 2005. For this calculation, I will draw figures from EIA "Table 2.9: World Production of Primary Energy by Energy Type and Selected Country Groups (Quadrillion Btu), 1980-2005", located here. L: Liquids. 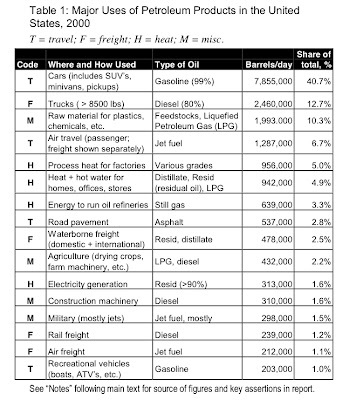 This is listed as petroleum in Table 2.9. It includes ordinary crude oil, condensate, NGL and tarsands. G: Dry natural gas, not including NGL. R: Renewables*. Net electric power from geothermal, solar, wind, wood and waste. Using these terms, world total energy production can be expressed as T = L + G + C + H + N + R.
In the immediate aftermath of peak liquids, all of the other sources will be available to compensate for a decline in L. So (until peak G) the term "alternatives" will mean the aggregrate of G, C, H, N and R. As you can see, L accounts for a little more than a third of world energy production, so there is really no problem of scaling alternatives in the initial post peak-liquids phase. The alternatives are already twice the scale of the factor to be compensated for (L), and about 100-200 times the scale of the likely annual decline in liquids production (assuming a decline rate of 1-2%, see #327 below). I've shown below (#327) that the net decline rate of liquids is likely to be less than 2% for decades. Now, liquids account for 37% of total energy (T), so a 2% decline in L gives rise to a (.02)(.37)= 0.7% decline in T. This, however, assumes that all the alternatives (G, C, H, N and R) do not increase. At what rate do the other alternatives generally increase? The following Table shows the production figures (in quads) for the most recent available years (2001-2005) in Table 2.9. dG, dC, dH, dN and dR indicate the respective growth rates (as numbers; multiply by 100 for percent). Finally the lowest row shows the average growth rates over the past 5 years for G(2.9%), C (6.2%), H(1.5%), N(1.4%) and R(7.3%). Which is more than enough to compensate for the 0.7% loss in T due to the decline in L. That is, world energy production will continue to increase by about 1.9% per year, assuming business-as-usual growth in alternatives, even in the face of a 2% decline in liquids. Natural gas grew by +4%. Nuclear power boomed, rising +60%. Hydroelectric grew steadily, rising +11%. Perhaps the best illustration of this principle, however, is peak oil itself, which (as of this writing) appears to have occurred in May 2005. 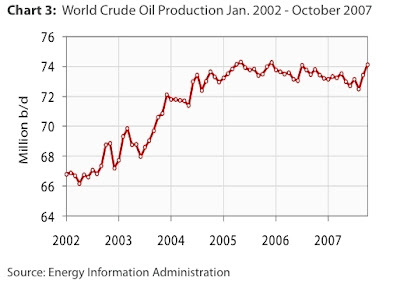 Oil showed no growth at all in 2005 and 2006. However, total energy consumption in 2005 was 2.9% higher than in 2004, and total energy consumption in 2006 was 2.4% higher than 2005 (BP Statistical Review 2007). 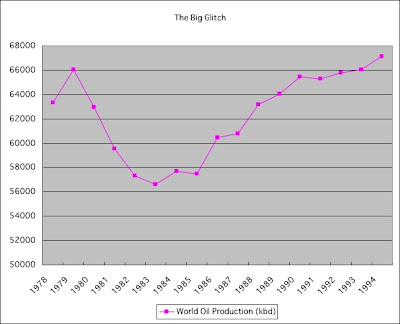 Peak oil is not stopping growth of total energy. *) Note that these figures ridiculously underestimate the contribution of renewable sources like solar to primary energy -- a point demonstrated by Hermann Scheer. For details, see 284. RENEWABLES PROVIDE A LOT MORE THAN A "TINY" FRACTION OF PRIMARY ENERGY. There is a lot of doomer FUD circulating in the peak oil community about how global oil production will collapse or decline rapidly in the post-peak period. Some of the worst offenders are suggesting that production will decline at rates of 8-12%, or more. These people are fearmongering, plain and simple, and have no sound basis for making these claims. Here are 4 good reasons why global liquids production will decline at a mild rate of less than 2% for 20 years after peak oil. 1) Stuart Staniford of the Oil Drum has shown that Hubbert Theory says Peak is a Slow Squeeze. 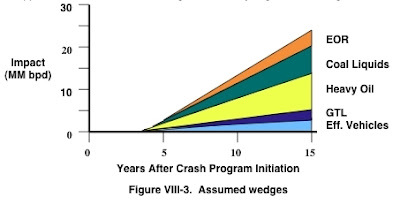 His analysis shows that (on the average) the world will decline at a rate slower than 2% for 20 years. In fact, it suggests the world will decline slower than the U.S., where liquids production has been declining at an average annual rate of 1.4% for 36 years since its peak in 1970. 2) Colin Campbell currently predicts, in the ASPO Newsletter for Jan. 2008, that liquids production will drop from 87mbd at peak in 2010, to 60mbd 20 years later in 2030. Bust out the calculator, folks. That's an annual decline rate of 1.8%. I have access to several technical databases. 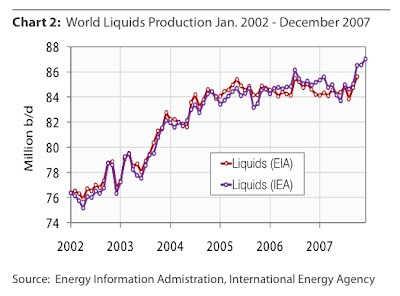 Liquids production will significantly decline after a likely bumpy plateau 2010-2020 and likely chaotic oil prices. 30 years from now, production of easy oil will be 35% less than to day but production of all liquids (including from coal and biomass) only 5% less than to day. Eyeballing, the forecast is for 73mbd in 2040, down from a peak of about 92mbd in 2015. That's an annual decline rate of 1%. 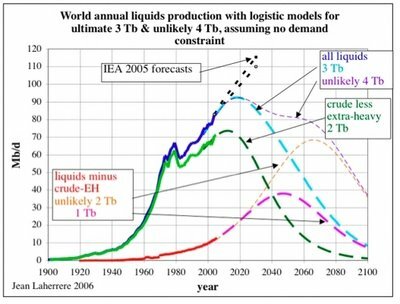 To conclude, we've got the four smartest people in peak oil saying that the world liquids decline rate will be 1 to 2% for decades after the peak. To those doomers who remain unconvinced: I hereby issue a challenge. Post in the comments. Show me the argument that proves Stuart Staniford, Colin Campbell and Jean Laherrere have got it all wrong about peak oil.